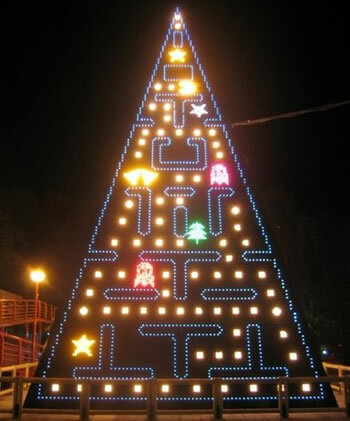 Since childhood, games and Christmas have been linked. That was the time of year I knew I could ask people to get whatever game I was eager to play and there was a pretty decent chance it would show up under the tree on the 25th. Remember the Nintendo 64 kid? That video was a hit not just because it’s funny but because many of us have had similar experiences – those mornings where you got what just what you wanted and life was great. As an adult with kids of my own, it’s different but still fun. A lot of good times are still had around this time of year, but the troubles and responsibilities of adulthood are also present and sometimes amplified. I recently was told by Degica that this blog would be discontinued. They are looking to cut back and even the fairly modest cost of maintaining this blog was deemed an unworthy expense. The social media will continue but it won’t be written by me. I’m not sure what my professional future holds, but for now I just will try to enjoy the next couple of weeks with family and friends. I hope you all have a great holiday season and that you get the awesome games you asked for. It’s been a privilege to discuss games with you all. Maybe one day we’ll meet again. Until then, keep up the good GAM MAK. For our final piece of IGMC coverage, let’s take a look at the Engine Prize winners! A diverse bunch to be sure. In an interesting twist, not one but two of the most memorable games of this year’s contest featured talking with ghosts as a central plot point. Kinda like when Antz and A Bug’s Life both came out in 1998. This highly polished RPG flawlessly evokes its 1920s setting with its art and music, but the unique characters will subvert the expectations of many players. 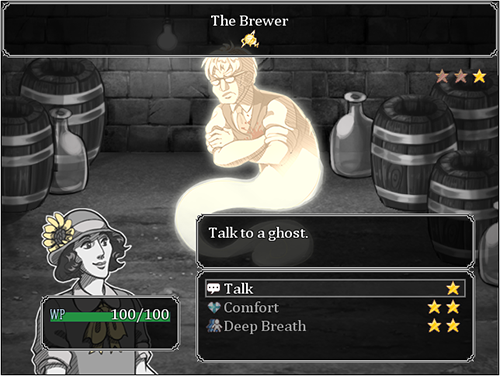 The two paranormal investigators at the center of the story have a variety of humorous, interesting and sometimes moving encounters with ghosts, often during the game’s creative battles. This was by far the most competitive of the engine prizes but Free Spirits won handily. The story of Meadow, a young girl who finds herself trapped in an underground labyrinth filled with steep cliffs and slippery sludge. 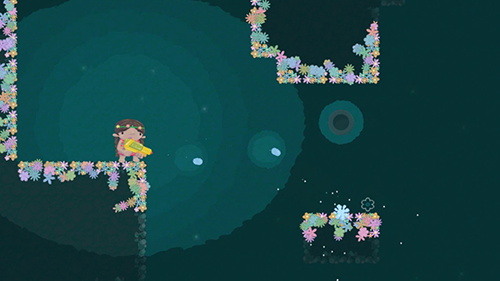 This platformer relies on her magic super soaker that can spawn flowers that help her safely traverse the area. But they only last a few seconds so you have to move quickly. A very creative concept but I suspect that the lack of controller support kept it from advancing farther. Trying to aim the water gun and jump around was tough on just a keyboard. Gotta love that Old West font. 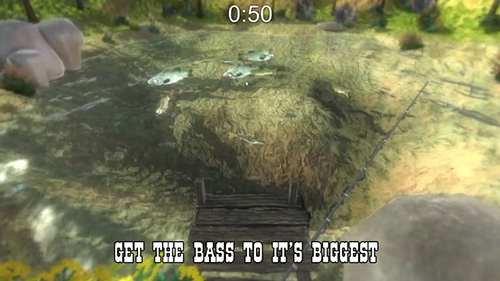 Fishing Sim is exactly what it says in the title, a credible fishing game that challenges you to catch a variety of fish, including the elusive bass. Catching is only half of the game, however, you are also raising them to be big enough to sell for a nice price but not so heavy that you can’t catch them anymore. Rendered with pleasant graphics and a clear familiarity of its subject matter, it should delight any fishing enthusiasts who come across it. A first-person adventure in the style of Slender but thankfully not quite as brutally unfair as that game. An archaeologist wanders a mysterious landscape in search of ancient artifacts but a huge monster is stalking him every step of the way. The game is particularly memorable thanks to the neon colors of the landscapes, creating a truly striking environment that is fun to explore when you don’t have that monster on your back. App Game Kit was clearly the right engine for this one, since Nerius looks a lot like a professional app you might see on your phone one day. Detailed and polished art catches your eye right away, but the bright colors are also central to the gameplay. Your character walks around with a giant bucket on his back trying to catch colored raindrops. The steep learning curve of the gameplay (or at least, how to score the most points) probably kept this game from getting farther in the contest but the artistry is highly impressive. This retooling of Frogger wasn’t the most ambitious entry in the contest, but it’s a good time. A blue box (the chicken is presumably at home enjoying his time off) tries to cross a series of roads, first dodging cars and eventually trains. Like Little Big Runners, it can go on forever depending on how well you do. GG Maker hadn’t been out for very long when the contest began, meaning that whoever won this award would have to get the hang of it quickly. Project Gemini seems to have the basics down pretty well as the player is plunged into a surreal adventure featuring a hero who begins to lose track of whether he is dreaming or awake. Boasting voice acting and custom artwork, this is a good demonstration of what the engine can do. This year’s contest saw much more variety in terms of genre than the last. It may have helped that thanks to the success of the Humble Game Making Bundle, which was tied to the overall prize pool, we were able to give out numerous genre prizes! Let’s have a look at them, shall we? While not as omnipresent as last year, RPGs still made up a majority of the contest entries. The winner of this category would really need to bring something memorable to the table and Grist of Flies certainly managed that. The battle system is unlike anything I’ve seen in RPG Maker. As you wander some kind of post-apocalyptic setting, you find yourself managing more and more characters (up to 15!) in battle. They are clumped into groups of five, with each contributing an action or two. Shuffling your characters into different groups and learning which combinations of techniques are best is quite entertaining. Add some tight pacing and excellent music and you have a very engaging experience that came close to placing in the top 3 and easily won this category. 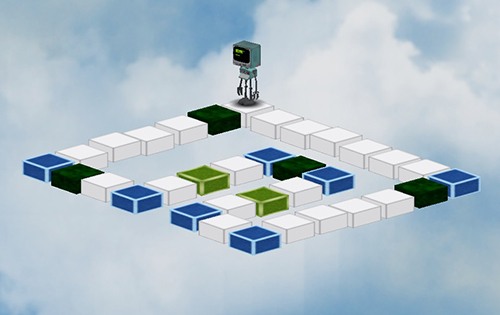 One of the most ambitious games in the contest, Robocoder challenges users to navigate a robot using strict programming lessons. It looks easy when you see the layout of the path, but even the slightest error in your commands will send the robot off the edge (while letting out a humorously human-sounding scream). This is a very challenging game, especially for people who don’t usually work with this kind of language, but highly rewarding when that robot goes exactly where you want it to. It’s both a fun puzzle game and a fairly effective programming tutorial. Shooters seem simple but they are hard to do well. I played enough disastrous ones while judging this contest to know that. 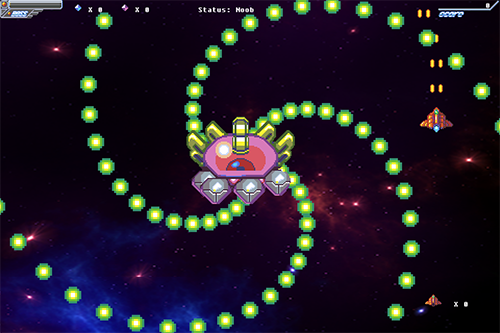 The one that stood out was Bosstardian, a classic arcade-style shooter with a central quirk that just happened to line up with the contest’s theme of growth – gather enough power-ups and the ship becomes enormous. Destroying everything in your path with a ship that took up half the screen was a great time and my only real complaint was that I couldn’t do it whenever I wanted! Obviously, this game doesn’t reach the intensity or complexity of the stuff that Taito or CAVE are putting out these days, but for a month-long contest it was highly impressive. This tale of a stranded space traveler and an android seems simple but sneaks up on you with its thematic depth and fun puzzles. The two characters must work together to solve puzzles that are, for the most part, very well-executed. As you explore, you will occasionally answer questions that the “newborn” android has about life and morality. These answers are incorporated in a fascinating way during the finale. 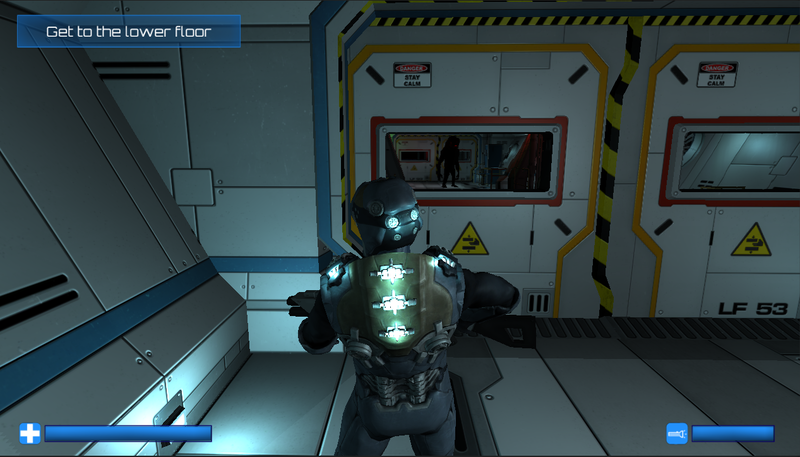 The visuals make good use of the Futuristic Tiles (available at the Game Dev Fort store!) and some scenes will surprise you with their beauty. A very well-rounded game. This fun little arcade game has is more polished and has more professional-looking graphics than a lot of phone apps that are currently making buckets of money at the App Store. 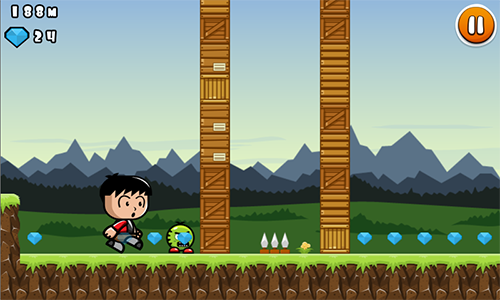 Your character increases and decreases his size as needed to navigate various obstacles (a lot of theme points for this one). By design, it can get repetitive and it doesn’t take long to feel like you’ve gotten the whole experience. Still, this game was a total blast and I can’t help but wonder what a more traditional platformer would be like with these mechanics. 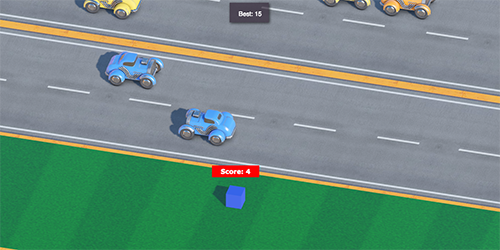 This is a very short game (about 15 minutes to finish) but a lot of polish is packed into that brief amount of time. Following some kind of nuclear apocalypse, a survivor tries to grow enough fruit to survive even though the radiation mutates the fruit into having all sorts of bizarre effects. Just as you’re starting to get used to the idea, the surreal ending comes. 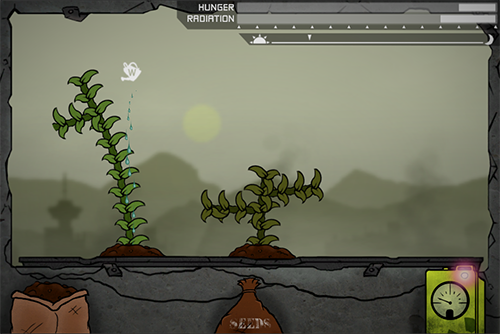 The interface is well designed and the plant growing animations are very smooth. A great introduction to what could be an even more impressive final product someday. Toy Story goes to war. This game is a fairly traditional real-time strategy game with one fun twist that fit the theme nicely. 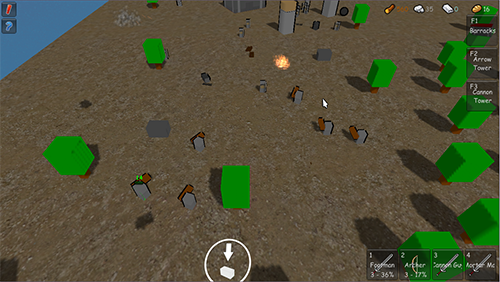 Soldiers of the same type can be combined into larger units – stacked like blocks, in other words. The game does a good job easing you into its combat but getting to terrorize your enemies with gargantuan toys made up of 20 or 30 units is a real thrill. The camera controls are also well done – I remember being really impressed with how far you could zoom out to get a view of the battlefield and how close you could zoom in to get a better look at your soldiers. Best Platformer – Oh! I’m gettin’ taller! Sweet, charming and nostalgic, this game follows a little boy through his daily life as the real world blends with the world of his imagination. The visuals are beautiful, as is to be expected by the creators of last year’s Little Briar Rose, but it’s actually the emotional soundtrack that really makes this story take flight. As the boy grows older, he is able to solve more of the game’s wide variety of strange little puzzles. A distinctive game with a distinctive tone. That’s all for now! The Engine prizes are coming next week! We’ve looked at the big winners and met their creators, but there were a LOT of other games in this contest. Despite how many different awards we gave out this year (a feature on the genre and engine prizes is coming soon), there were many more that we liked but just didn’t make the winners list. To give them some love, all 8 of the judges picked a game that didn’t win any other awards. We wrote up a summary of what made it appealing and, in some cases, why it didn’t quite make it to the end. Make sure to check all these games out! 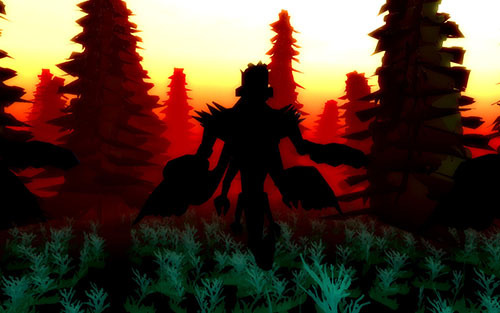 While there were plenty of games I loved in this years competition, one that stuck out to me from the very beginning was Ruin Frontier Zero, a dynamic, nonlinear RPG. The first thing that hit me was the overall setting. I’ll admit that I’m a sucker for scifi settings, and playing as the AI fighting against humanity was a fun twist to that trope. And then the second part hit, that is the other thing that I’m a sucker for: Robot/Mecha customization. 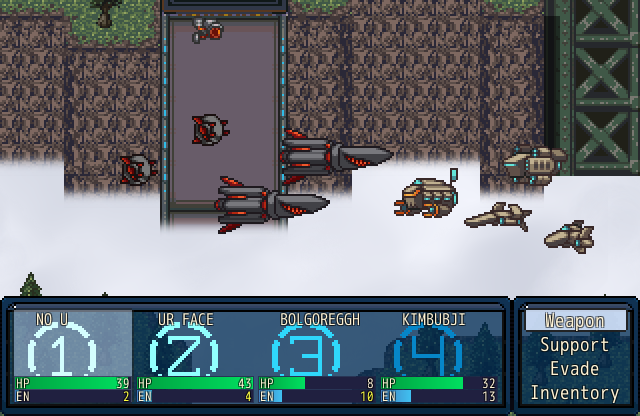 My favorite genre in stories is probably mecha, which is something you don’t see a lot of in RPGs, and while this isn’t strictly mecha, the drones are close enough to have caught my attention. Building your squad, and naming the individual members, was a real joy. BYOG (Bring your own Gauss) the Interceptor felt fun and distinctly mine as a character. That isn’t to say the game wasn’t without flaws. The difficulty was on the easy side, and the enemy encounters were perhaps a bit too fast to dodge, but the cohesive whole of it was a game with a heavy sense that your party was YOURS, rather than what the game gave you. This already relevant game became disturbingly more immediate after the recent wave of terrorist attacks in France and other countries. Those of us living in the western world hear about groups like ISIS (called Da’ish in this game, a name they reportedly hate so let’s all start using it) only when they became a danger to people who look like us. But imagine having to live in the same village as them. The characters in Salim do and their daily life is rendered with absolutely gorgeous artwork resembling paper and cardboard. The story plays out like a cute little adventure game where the title character explores his hometown and trades amusing video game jokes with his friends and family. Even the broken English dialogue adds another layer of authenticity, since we’re in a place where English isn’t the primary language. However, the tale is often interrupted by Da’ish, who are perfectly willing to shoot a child over minor offenses like eating during the fasting season. The developer doesn’t force us to watch this kid die, but we’re left knowing that this is the kind of thing that happens in the areas where these fanatics have taken hold. Some people don’t like when games are blunt with their messages and I understand that. However, this is a crucial voice that often goes unheard. People love to complain that moderate Muslims never speak out against groups like Da’ish, so here’s your chance to hear what they have to say. This game is noble and beautiful and well worth a look. I’m awarding it my first ever Cade Mistral Passion Award. If you’re a fan of classic first person dungeon crawlers, Once Upon a Beanstalk is a unique take on the old formula. 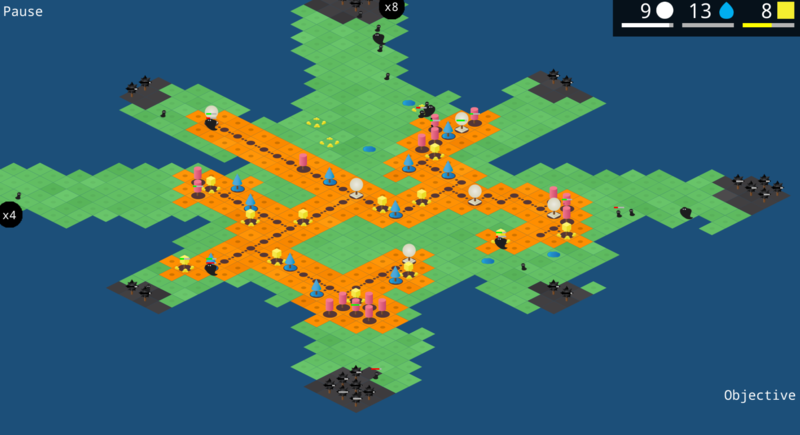 It plays like a rogue-like with floors that are procedurally generated. It does a good job throwing enough new stuff at you to keep the opening levels engaging. The game relies heavily on RNG so your experience might greatly vary. For example, I got stuck with a crappy Cursed Sword early on. I did manage to improve the sword with Whetstone items but it did hamper my experience quite a bit since I wasn’t able to try out different weapons. With additional development time, I can see this game becoming a very addicting and harrowing experience. 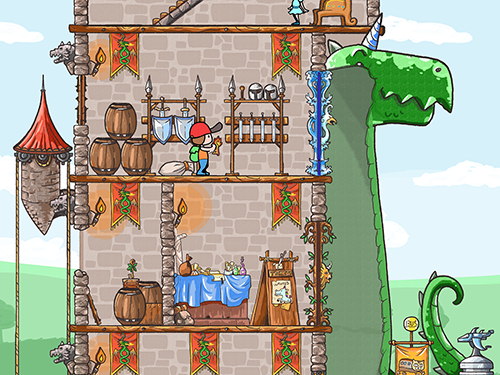 Half-Off Hero is a delightful game about an unwilling merchant hero whose goal is to save the world from impending doom. You play as a loving family man who simply wants to run his shop. However, fate has other plans for you as you are now forced to journey to save the world while making sure your family doesn’t desert you while you are away. As a merchant your primary goal is of course to obtain enough gold to feed your family and prevent yourself from the immense debt you may build up from all your loans, shop upgrades, and medical bills following your battles. A nice mix of selling items and battles gives you a break from the usual grind of continuous battles. The battles found in Half-Off Hero are much harder than what they at first seem; after all, you’re a puny merchant who is used to selling weapons, not using them. Half-Off Hero can provide a nice challenge to those who are willing to study the weakness of their foes and stock up on magical items to battle them. Those who can effectively plan for battles will avoid a nasty trip to Mendi, your “loving” doctor. Perhaps the biggest draw for this judge was the game’s fantastic art and creative story. 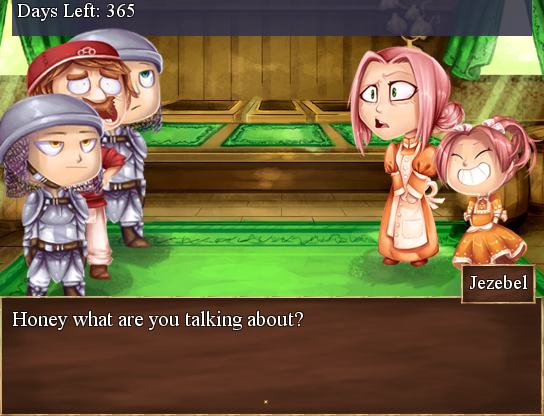 The characters are represented by beautiful custom art as well as dialogue to help immerse the player in the role of the unlikely hero. 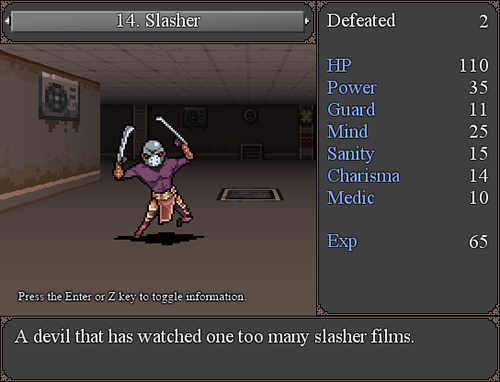 Half-off Hero features various endings for the story as well as many mechanics that can affect your gameplay. There are about five endings for your playing pleasure, giving you all the more reason to attempt to save the world multiple times. I highly recommend Half-Off Hero: The World Needs Savings for those who don’t mind balancing the all the mechanics involved in the life of a merchant hero and are interested in fairly well-polished IGMC game. I have to admit – I’m not very good at wall jumping games. Most games that have that aspect in them usually end in me frustratingly swearing at the screen, demanding to be allowed to pass and finally calling one of my brothers to get me past the damn thing. Not so for this game. Gambol is all-around a pretty great game. Not only are the graphics and animations cute, there’s also a lot of great design ideas used through-out – whether it be the maps shown as part of the background at the start of each stage, or the simplicity of the walls themselves. It’s biggest draw, though, was it’s ease of use. This isn’t a game that I called upon the force of brother to get through because not only were the controls responsive and easily understandable, the cause/effect when jumping and falling were so well done and perfectly timed to allow a newbie like me to catch myself when I fell. Gambol is very well done, mechanically, as well as graphically, and I personally think it was one of my favourite games to come from the contest. 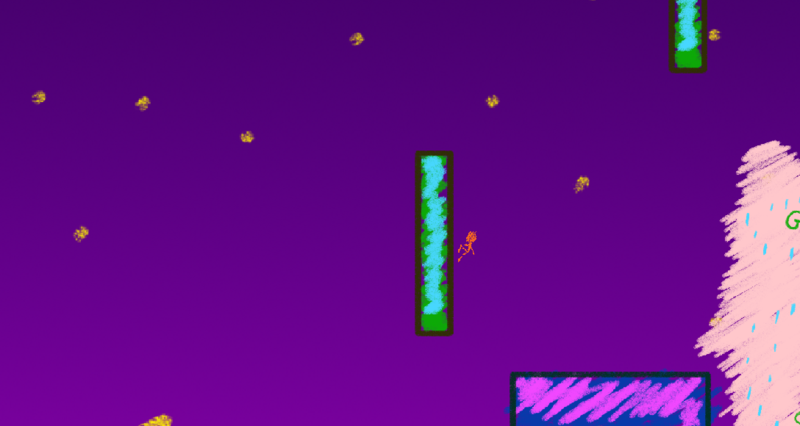 Great job, VP – you made a wall-jump game that even I could play and, more importantly, enjoy. And it’s pretty damn cute, too! The overall aesthetic of the game is simply stunning. Lovingly crafted environments dot the game throughout, with a few pieces shining above the rest. The general look and feel of the game is one of clean simplicity, which contrasts very well with the chopped up and inherently opaque narrative that is told over the course of the game. While the exploration aspects, as well as the narrative are masterfully done, the game as a whole feels disjointed and doesn’t always appear to know what it wants to be. The inclusion of standard RPG combat in an otherwise non-standard game leads the player to wish they’d have come up with something else. Reminiscent of Sword and Sworcery, this game is overflowing with tone, mood, and feelings. Escalia reminded me of Fire Emblem, specifically from the GBA era, and that is a really good thing. I wonder if the developer(s) used those games as their initial source of inspiration. 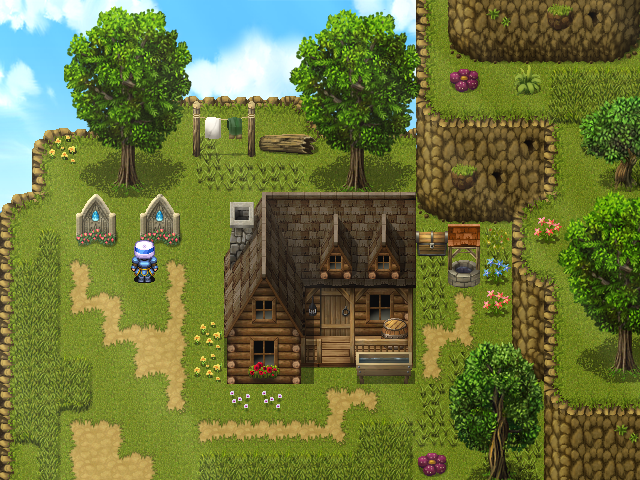 The art style, as far as RPGMaker goes, came together really nicely. The intro text was well-paced and the story foreshadowed depth and lore to be discovered later on. My one big hang up (and it’s a big one!) is to be thrown into an open town so early on. I feel like this game needed more linear first hour of play, to usher the player through the narrative and get them to a good level of “buy in.” I hope this sees the light of day as a completed game some day! Silver Creek Falls was very enjoyable. There was something about the mystery that kept me engaged and made me very curious to see what happened next. The voice acting used during cutscenes was a pleasant surprise. The lack of combat helped to show that an RPG Maker game could be made that doesn’t rely on the engine’s popular combat integration. Along with the inherent mystery, the characters are well written and designed in a way that keeps the player interested in their tale. 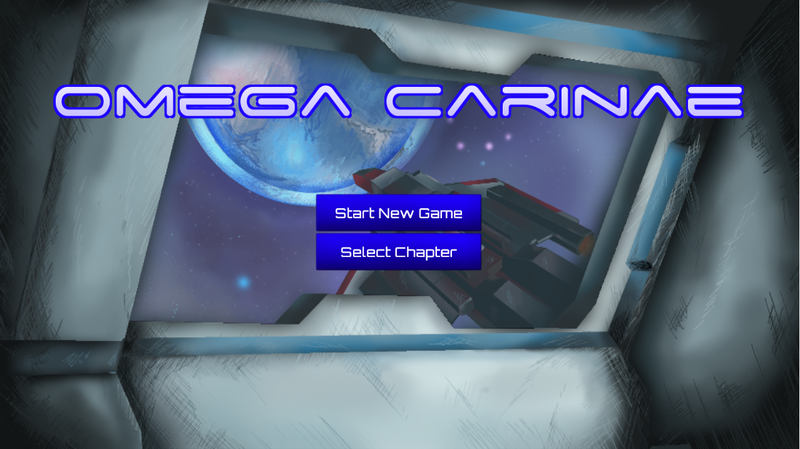 The game that ultimately won this award through purely democratic means is Omega Carinae, a science-fiction adventure created by a team that includes Federico Diaz, Juan Castagna and Roberta Guida. While classified as a shooter for the purposes of the contest, this Unity game also has prominent adventure game elements. You follow a lone space explorer navigating the cosmos and upgrading your ship at abandoned modules. However, these spooky locations begin to get increasingly dangerous. The environments in Omega Carinae are very well presented, especially the colorful outer space areas. 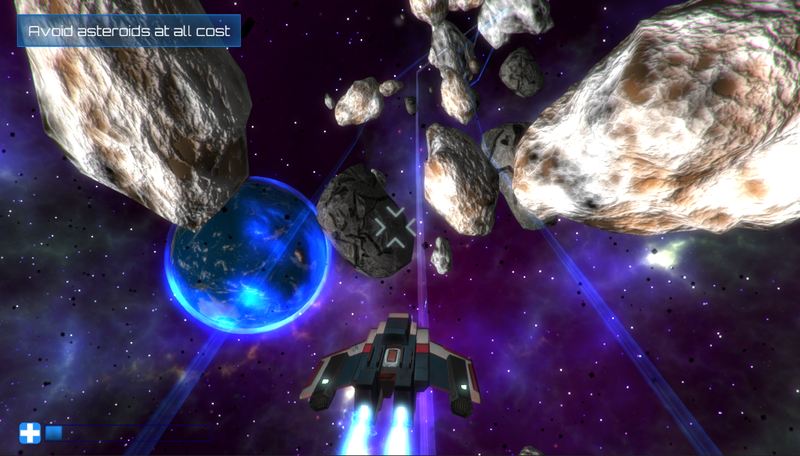 In this sections, you steer the ship through asteroid fields, dodging or shooting them to protect your ship. However, you can only move inside a specific area encompassed by blue lines, making for some hair-raising moments. It was a smart choice for the contest, since giving the player a chance to explore the vastness of space seems far too ambitious for something that has to be done in 30 days. 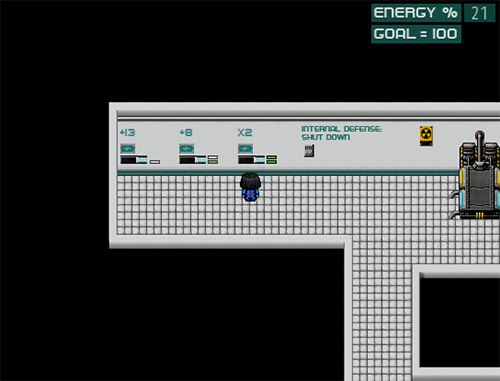 Alternating with these levels are explorations of the modules during which the protagonist navigates dark corridors looking for upgrades to his ship. While the modules mostly look the same, they look convincing and are very well-lit. The game eases you into these sequences gently, to the point where I nearly jumped out of my skin the first time an enemy showed up. It probably didn’t help that the alien looked like a cross between Bigfoot and the horrifying face creature from David Lynch’s Inland Empire. The game is generally solid although there is one issue that was a persistent nuisance. The mouse controls were extremely sensitive and sometimes downright wacky. During the exploration parts, the mouse moves the camera and I kept finding that all it took was a gentle nudge to make me feel like I had just gotten off the Gravitron. It wasn’t quite as problematic in the ship sections, where the cursor controls where you shoot, but occasionally a routine move would move the camera into a spot way off the ship’s path and I would have to mess around a bit to find myself again. I never got around to judging this game in the contest but I suspect these issues are why it didn’t make it to the later rounds. Regardless, it’s a game that shows off the virtues that defined this year’s contest a whole – ambition and creativity. Check it out and tell us what you think in the comments! It’s not a good idea to judge a book by its cover. Every so often, however, the cover is accurate. I didn’t end up judging Symbiote until fairly late in the contest but when I took a look at the screenshots, I knew this game was going to be good. Sure enough, Symbiote was one of the entries that felt the most like a true complete game, a beautifully-realized platformer in the “Metroidvania” style with excellent character animation and fun level design. Following a disastrous space expedition, a young girl named Aubrey comes into contact with a mysterious symbiotic organism that allows her to traverse dangerous alien environments. As she discovers new abilities for the symbiote, she gets deeper into hostile territory. The symbiote itself has unclear motivations. Will it ultimately prove a danger to its host or has it grown fond of the young girl? You’ll have to play the game to find out and I highly recommend you do. 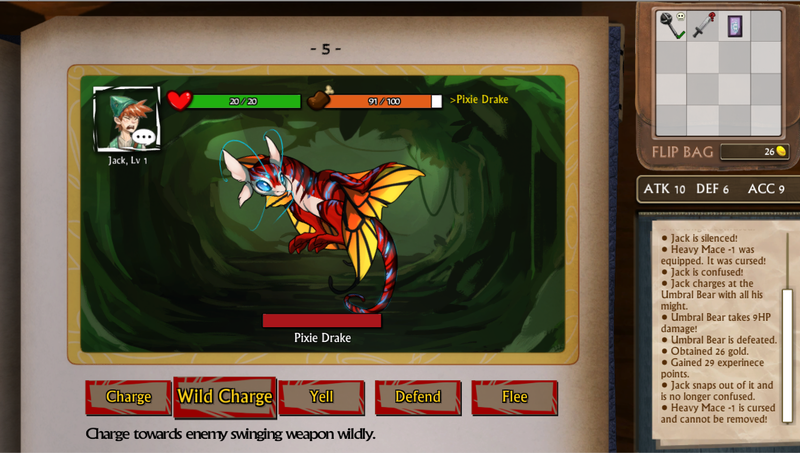 I spoke with the creator, Jason Perry, to learn more about the game. First off, congratulations on the third place finish! How did you feel when you saw the results? Genuinely surprised! I thought that I was going to win a best-in-genre award, so overall third prize was super exciting. You’ve been involved in the indie game world since before it was even called “indie gaming.” Are there lessons from your past projects that helped you pull off a game like Symbiote? The character design for the protagonist is very unique. What appealed to you about a young child being given such formidable skills? Young protagonists always appeal to me, because that perspective helps evoke sensations like curiosity and wonder. I like that kids can play my games. But don’t let your guard down: if you’ve beaten the game (and if my rushed dialogue does its job), there’s a realization about the protagonist that’s very dark. I think it’s a fun contrast to the brightness of the art design. Aubrey uses big, bold colors, and I think that’s important for giving a protagonist an “iconic” look. Her notable trait in this game is the blue-green symbiotic “armor” that covers her entire body, which I knew that I needed early on– because it’s the base of the gameplay mechanics and the story. Ultimately, the deadline again played a role: I settled on a design that wouldn’t take me too long to draw and animate. Early concept art for Aubrey. I was particularly impressed by how fluid the lead character’s animation is. How much time did that take to get right relative to the overall production time? Thanks! The player character’s animations are very important to me, and I think that good animations can make or break the way a game feels. 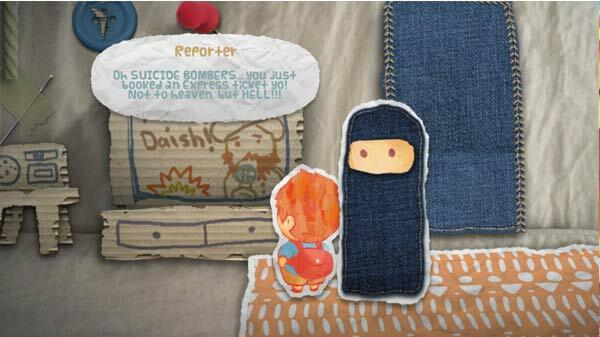 I used a combination of puppet animation and hand-drawn animation. I actually wrote an article about Symbiote’s animation process here. Do you see this game as eventually being longer, with more abilities and places to explore? Or are you satisfied with its current length? Of course the game needs to be bigger! When I was first writing out my ideas, I tried to keep the scope small because of the contest’s deadline. And I STILL had to cut out entire upgrades and areas. Not to mention the boss fights. I have enough plans for mechanics and areas that Symbiote could be much, much bigger than it currently is. Is there additional lore about this world and characters that didn’t make it into the game? If so, can you give us a sample? There’s a lot that didn’t make it. And that stuff left holes that I plugged with other new stuff. The original plan was to use the lore to really get into the minds and backstories of all the crew members. Some of that is still there, but the relationships were planned to be a lot deeper. As fun as it is to think of stories and characters, in a game contest with a tight deadline – story has to be an afterthought. Even though the story was an intricate web in my mind, I wrote all the dialogue/lore in the last day and a half, so a bunch of it is forced and the pacing is a little awkward. Indie platformers have been huge for the last couple of years. Are there any in particular that inspired you? Eddie Brock is super jealous right now. Unlike many similar games, combat plays a pretty small role in Symbiote. Was this intentional from the start or brought on by the contest’s time frame? You were able to put in controller support for this game, which proved essential. Was this a tough undertaking or just a slight increase in work? I planned for controller support from the beginning, so it wasn’t really difficult in any way. The hard part is knowing that some people tried to play it with a keyboard! Were you able to play any other games during the judging period? If so, which ones stood out to you? Do you know what your next project will be? This is a mean question– I have too many projects going on! Of note: I’m the art director on a monster-catching RPG, and I’m already working on my next platformer using what I’ve learned from making Symbiote. 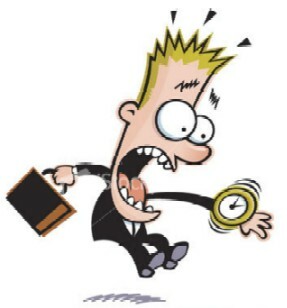 And of course Time Fantasy is an ongoing project with no end in sight. Plenty of fun stuff in the future from me! 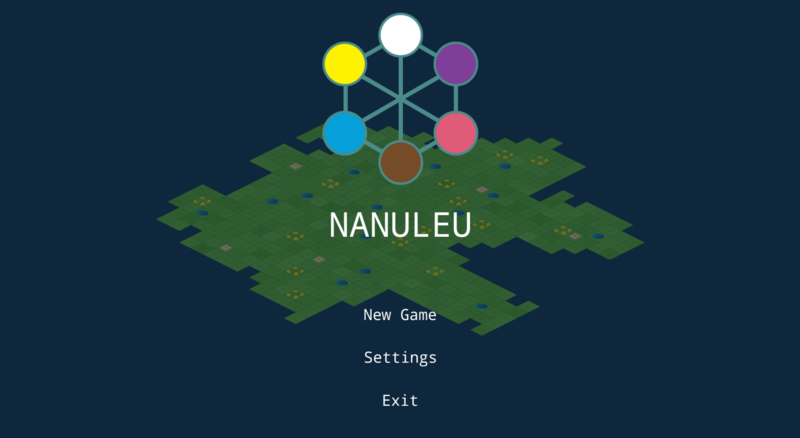 Nanuleu is a tough game. Like Corinne Cross’s Dead and Breakfast, I was the first judge to take a crack at it. 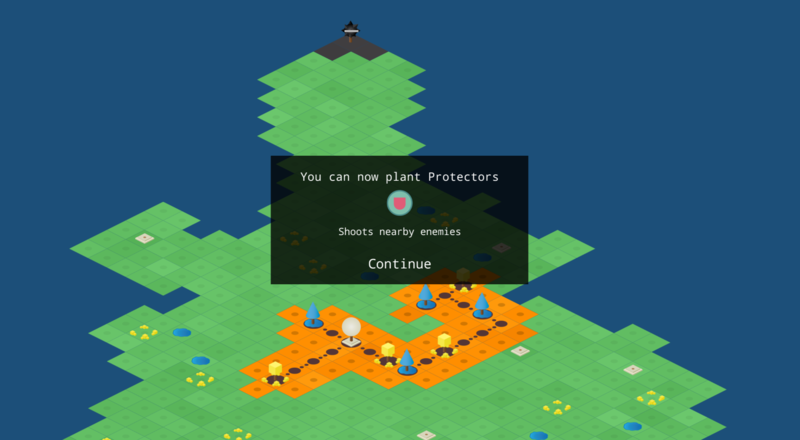 The game is an elegant real-time strategy/tower defense game where the player collects resources to grow plants in preparation for an invasion of enemy forces. When the mysterious dark figures finally arrived, I didn’t last long. At that point, I could have moved on to the next game in my batch….but I wanted another shot. I felt like I could win now that I knew what I was in for. That’s the kind of game this is. This process repeated itself two or three more times and I realized I had better get to the rest of the games. Still, Nanuleu was one of the most pleasant surprises of the contest and it continued to surpass expectations until it landed in second place. With its smooth animations and moody background music, the game is a very immersive experience. It also was one of the best examples in the whole contest of the “Growth” theme. Indeed, growth is the very essence of this game as you continue to sprout new trees in your desperate attempts to fight off the invaders. I spoke with the creators, Alhvi Balcarcel and Carlos Villagran of Selva Interactive, to learn more about the game. How did you feel when you heard you won 2nd place? Congratulations! Carlos Villagran: Thank you! We were very happy, there were other good games that could have won and we were very nervous about it. But we were more shocked when we found out we were on the top 10. At that point we really had no idea how our game was doing or if it had been disqualified for some bug or glitch. Alhvi Balcarcel: The first surprise was the top 10. I couldn’t believe it. After that I thought we would get the genre prize. It was a big surprise to get the 2nd place. Let’s start with the name. What does “Nanuleu” mean? AB: We are from Guatemala. Nanuleu is a spelling variation of Nan Ulew, that means “mother earth” in Quiché language, one of the 21 Mayan languages spoken in Guatemala. We decided to choose this name even though we do not speak Quiché, but Mayan languages and traditions are a big part of Guatemalan culture and we wanted to use something that could represent our country. 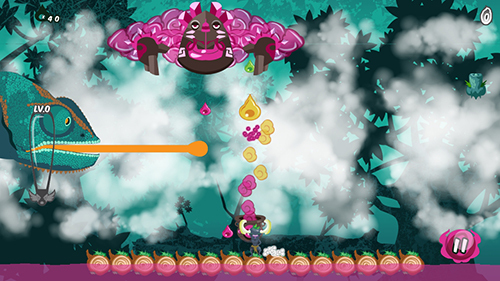 The game perfectly captures the contest’s theme of Growth. Did the theme give you the idea for the game or were you already planning to make the game this way? CV: We were really lucky. We had already planned to make the game very similar to the final game but we were still discussing the idea. We didn’t know what the structures could be; we thought we could make an alien civilization or a very advanced country. When we heard the theme, we decided it had to be plants. You’re going to need a LOT of these. As a two-person team, how did you divide the work? Who did what? CV: We both are programmers so at first the two of us worked on the prototype. 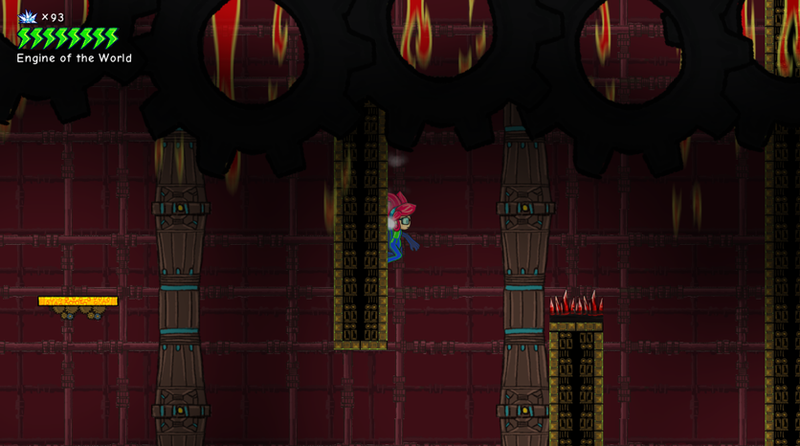 When we got the basic mechanics working, Alhvi started doing the art and I kept working on the code. We both tested and made game design decisions together. AB: I also looked for music and sound effects to use. That was one of my favorite parts. The premise of Nature fighting invaders is powerful in an archetypal way. Do you see it as a metaphor for anything? Some kind of environmental message? AB: Indeed it is, but in fact, we did not plan to convey this specific message. As Carlos said, in the beginning we were exploring some ideas about an alien lifeform or connected circuits. Was there anything you wanted to add but couldn’t because of the deadline? More units, perhaps? AB: Yes, we had planned to include a story. The invaders were once part of your civilization and corrupted by evil. They left a long time ago, but after they attack you, one of them repents and comes back to your home and then you’ll get units that are very similar to the attackers. We wanted to present it in a format where you could see a mural that tells you what happened. A new mural will be shown when you grew a new life tree. It’s still an idea we want to try, but we’re not sure if it will interfere too much with the gameplay. CV: Yes, well apart from the story, the last wave of enemies was kinda rushed in. Maybe we could have added something else or added them on a different way. Also we wanted to add more visual effects and animations for the structures and units. We would have liked to make the game a little faster at the start so players didn’t have to wait so long, but that caused a lot of problems on the endgame so we ended leaving it as it is. We’re gonna need a bigger forest. Were you able to play any of the other entries during the judging period? If so, what stood out to you? CV: Yes, we did play some. We played almost all the top 10 entries and a few before that. I really liked Symbiote’s gameplay. It’s a good game. 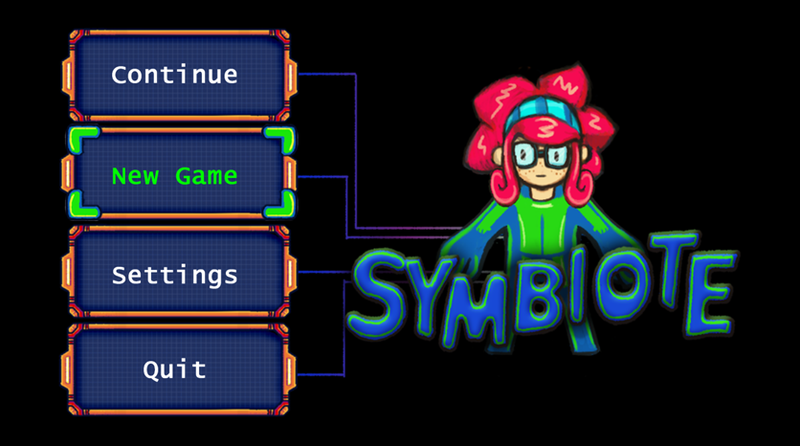 AB: Yes, we played some of the finalists and other games made in Latin America. I personally was amazed about the art quality and the stories presented in some of the games. I’m glad Corinne Cross’s Dead & Breakfast won first place; it was very well done. Also I really liked the art of Salim. It was outstanding. AB: We’re starting our indie game development company, Selva Interactive. We plan to improve Nanuleu and release it commercially. Last question – Is it possible to “win” at this game? I don’t think any of the judges were able to even though we all liked it. CV: Yes, it’s pretty hard but you can win the game. We actually wanted the game to be like this. A game that you have to play many times before you can win it. We had some people on our local game dev community test it. Some found it hard and some found it easy. We definitely need to make some difficulty adjustments and test it with more people. Several weeks and seven other judges later, that prediction was accurate. 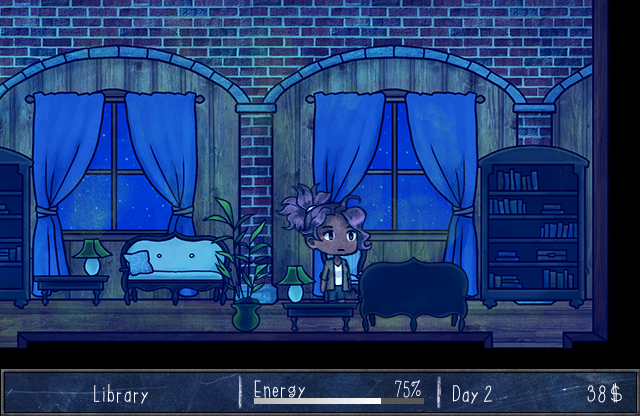 This enchanting adventure game follows the title character as she gets roped into house-sitting for a friend of her mother. Corinne quickly gets more than she bargained for when it’s revealed the house is haunted by numerous ghosts. These aren’t scary ghosts, just confused people trying to make sense of their new reality. The player interacts with them on a daily basis while growing and selling flowers to earn money and purchase food so the spirits can have their breakfast. The game is filled with stunning custom artwork, but don’t assume that it only won because it’s so pretty. This game has the best story and characterization out of any games I played for the contest and the adventure gameplay is simple but fun. It embodied the theme of “growth” in two ways – the literal growing of flowers and fully realized character growth for most of the cast. So many ghosts and not a jump scare in sight! I spoke with the creator, Cecilia Bishton of Bad Chalk Entertainment, to learn more about the game. First off, how do you feel? You just won almost $27,000! Some part of me still thinks I must be dreaming! It’s hard to believe, especially considering how fierce the competition was. It’s a huge honor and incredibly validating after a month of hard work. Everyone has been so kind, and it makes me really happy that people seem to be enjoying my game. I couldn’t be more thrilled about my IGMC experience. This game is full of custom artwork and is fairly long for a contest entry. How did you manage to finish it all in just a month? It was intense, especially considering that I found out about the contest a week into the development period. Any free moment I had from school and homework, I would be working on it. I kept notes, drafted schedules, and made daily to-do lists. I did the design and writing first, then spent the rest of the time switching between art, implementation, and testing. It was hard, but game development is what I love. I didn’t mind the late nights and the hours spent at the computer in the slightest. I was busy, but I was having a blast. 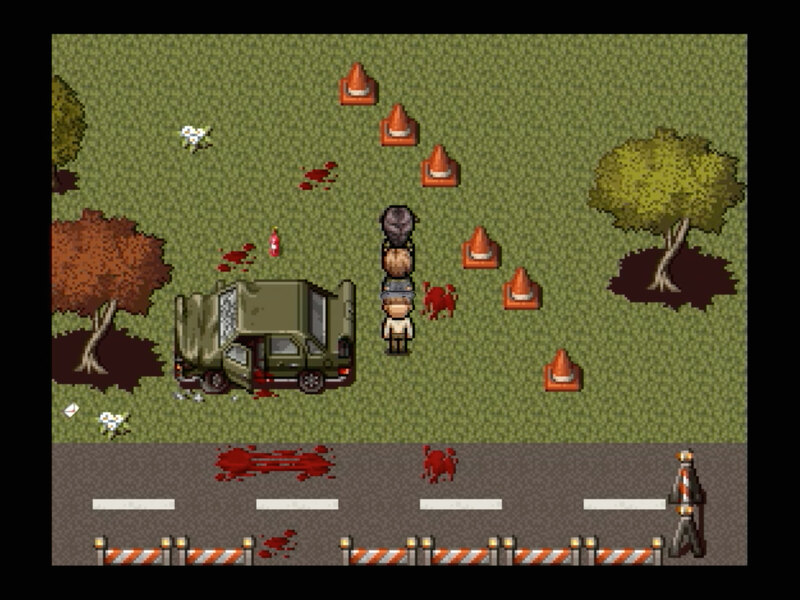 Nothing about the visuals suggests that this is an RPG Maker game, but it is. Did you consider another engine at any point? I knew right away that I would be using RPG Maker. Especially because I was coming into the contest late, being able to develop quickly was crucial. My previous experience with RPG Maker definitely helped me to meet the deadline. Besides, I had always wanted to try making a painterly side-scrolling game in RPG Maker, so this competition was the perfect opportunity! Were there any other RPG Maker games that inspired your approach? 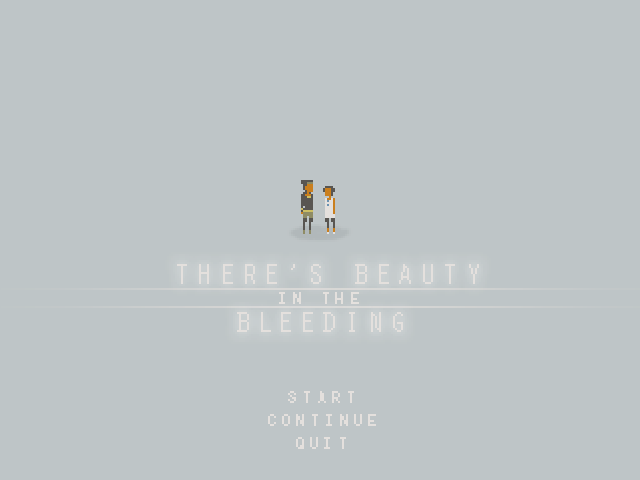 Not in particular, although I don’t believe I’m the first to try this side-scrolling style. I wanted the game to be illustrative and have watercolor textures, so having larger characters and maps was conducive to that. Was there anything you wanted to include in the game but couldn’t because of the deadline? Definitely! The interior of the greengrocer and the florist had to be cut out, along with their respective characters. 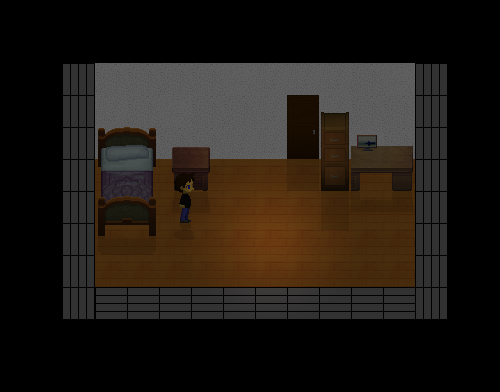 The implementation of the multiple endings was definitely rushed, as I was coming up on the deadline fast. I would have liked to put in more details and general polish too. For the most part, I was able to get everything I wanted into the game. Making decisions about what gets cut is just a part of working with a hard deadline. 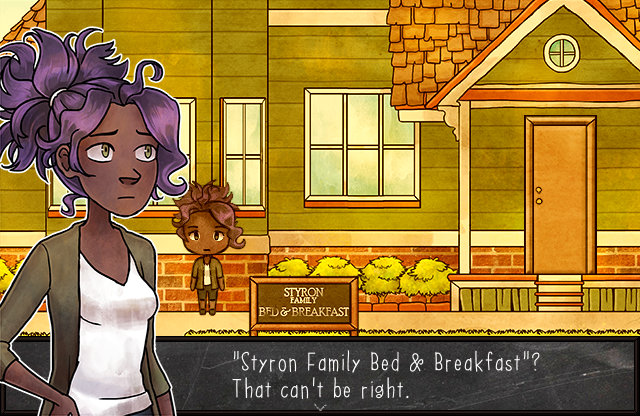 The character designs, particularly Corinne and her purple hair, are striking. How did you come up with the look for the characters? I designed their personalities first and let them inform their appearances. I’ve always been a fan of unrealistic hair colors. It adds more color into the world and creates a lot of possibilities for character design. It was important for me that the characters had variety to them—I really liked the idea of a group of unlikely friends brought together by this B&B. Yeah, this game’s not named after them! The writing in this game has a strong emotional undercurrent. At times it feels almost personal. I doubt you ever ran a haunted bed and breakfast, but were there any personal experiences that inspired this story? Corinne’s adventures aren’t based on any of my personal experiences (no haunted bed and breakfasts in my past), but I think you can see a lot of my personal philosophies on life in there—about pursuing your passions, making the most of your time, and being good to your loved ones. Growing and selling flowers is a key part of the game, but you also have the option of growing flowers in the nearby cemetery. What is the significance of this subplot? Does it tie into the game’s story as a whole? Paying your respects at the graves can help you earn the good endings with their respective ghosts. More importantly, I wanted them to serve as a reminder that the guests of the B&B are, in fact, dead. Have you had a chance to play other IGMC entries during the judging period? If so, which ones stood out to you? Unfortunately, I was too busy with school to try out many of the other entries! I enjoyed Free Spirits, even though I was terrible at the battle system. The art was fantastic and the 20’s setting was great. Our games had similar concepts (trying to get ghosts to move on to the next plane), but completely different approaches—and I think that’s really cool. What advice do you have for someone trying to make a memorable game in a short time? Make the game that you want to make. One of the best things about indie game development is the freedom we have when making our games. Find out what makes you passionate about game development and pursue that, whether it’s characters and story or gameplay and mechanics. When it comes to working with a short amount of time: find out what methods work for you when it comes to keeping yourself on task. For me, it’s lists. A lot of lists. And always keep your scope in check! I think it’s better to make a small game well than a big game badly. What’s next for Bad Chalk Entertainment? 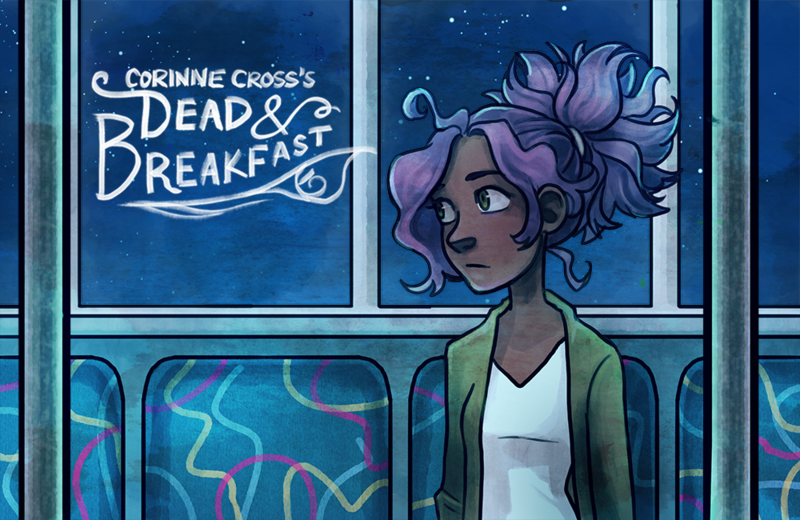 Since the contest ended, I’ve been working on an updated version of Corinne Cross’s Dead & Breakfast. I’m going back and adding the things I had to cut because of the deadline, improving the writing and art, and adding more content and detail in general. Afterwards, I’ll go back to working on GORGE, the project I was working on when I heard about the IGMC. It’s a pixel horror game about two girls who are trapped in a dark version of their hometown where everything revolves around food. I’m planning on submitting both games to Steam Greenlight soon. I’ll keep badchalk’s twitter and tumblr updated, for anyone who’s interested! Finally, the most important question…where is the recipe for the scrambled eggs? I couldn’t find it anywhere! Hahaha! This is a good chance for me to officially apologize for making the scrambled eggs so hard to find. Alex is the one who has the recipe. She’s hiding in the downstairs bathroom on night 4. I thought people would note her absence and go looking for her! I’ll make it a little easier in the updated version. I wanted to say one last big thank you to the IGMC judges/organizers, and to everyone who supported my game! Thank you! We had hoped to announce the winners of this year’s Indie Game Maker Contest on October 24, but while some of the celebrity judges have finished, we’re still waiting to hear the results from the rest. The team of staff judges is very excited to announce the winners and we’re just as bummed as you guys that we have to keep putting it off. We hope that all the external judging will be done within the next week and the staff will do what we can to make it as soon as possible. Here are the top ten games that were sent to the guest judges, in case you missed it. Thank you for your continued patience and keep watching this space for the winners! Is there a “Citizen Kane” of games? Citizen Kane is not only the classic choice for Greatest Film Ever Made, it’s become shorthand for the greatest of everything. There are other potential picks for this title of course, like The Godfather or Seven Samurai or about a third of Alfred Hitchcock’s body of work, but none of those are so routinely associated with the peak of an artistic medium. But is there an equivalent in video games? Is there a game whose greatness is so admired that it could reach this status? It’s easy to fill out a list of the 100 Greatest Games Ever Made, but is there just one that stands out? One that you immediately think of? Let’s have a look at some possibilities. Might as well start with Mario, right? However, there isn’t necessarily a unanimous choice for the greatest Mario game. The original, Super Mario Bros, is a key moment in gaming history…but it didn’t take long for it to become dated. The NES installment that holds up best is actually Super Mario Bros. 3, the highly-innovative platforming masterpiece that’s still really fun to pick up and play today. Not far behind it is Super Mario World, the SNES sequel that added even more variety to the experience and holds up just as well. Yet another contender is Super Mario 64, the first 3-D entry that kicked off the Nintendo 64 era. Like the original, however, this one has become more dated as 3-D platforming evolved. 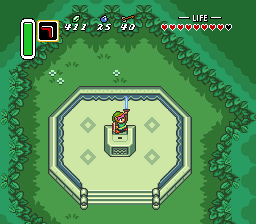 Then there’s Zelda and when it comes to Zelda, the debate shrinks to two games. A Link to the Past would be my personal pick. It took the best elements from the original and even some from its maligned sequel (i.e. the magic meter) and turned it into a game that I probably play at least once a year just because it’s always so fun! However, the fanbase at large seems to have chosen Ocarina of Time. I’m a big fan of this game as well, although I think it doesn’t match its predecessor in terms of gameplay. What I find even more exceptional is the presentation of its world and story. Ocarina has some of the best-directed video game cutscenes I’ve ever seen and the sense of drama you get from playing it was downright enthralling. There are some other SNES games worthy of consideration, like Super Metroid or Mega Man X, but there is one more in particular that merits a bit of discussion. Every so often I see a thread on game-making forums that asks the users which games inspired them to try and create their own. 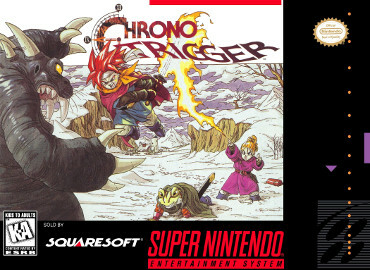 People list a wide variety of inspirations, but one game that shows up constantly is Chrono Trigger. This game has resonated strongly with people for 20 years and still enjoys near-universal acclaim. The stars really did align on this one and aside from having some of the best visuals and music of its era, the game’s story is a fascinating balancing act. On the one hand, it’s as accessible as the best Saturday morning cartoons but on the other hand, there is enough symbolism and subtext to support years worth of articles about its Christ imagery or its depiction of class hierarchy or whatever else someone sees in it. 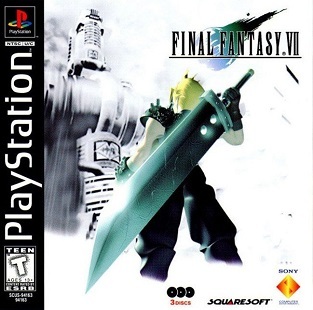 For a few years around the turn of the century, Final Fantasy VII had a pretty formidable reputation and might have eventually grabbed this “Citizen Kane” title. However, overexposure in recent years has made it a less palatable choice. Squaresoft realized at one point just how enduring its popularity was and shoveled out various prequels, spin-offs and the like, culminating with the recently announced remake that’s inevitably going to disappoint the fans (you heard it here first). It’s become tiresome, which is a shame because this game was a serious landmark in the medium’s capacity for storytelling. While sometimes muddled, the storyline was amazingly intricate and loaded with social/political commentary that was totally unheard of at the time. Its closest rival within the series is its predecessor, Final Fantasy VI. While not as allegorical as its sequel, the story of FFVI was powerful enough to stay with fans for many years. Another Playstation classic was Metal Gear Solid, which further upped the ante on how involving a video game story could be. David Hayter’s work as Solid Snake may have been the first great video game voice-over work and the twisty, action-packed storyline put many contemporary action movies to shame. MGS also mastered the stealth-based gameplay style after some not-quite-successful attempts on NES and interacted with the player in interesting ways, such as when Pyscho Mantis looked into your memory card. It’s aged well, even if having to look on the back of your game box to find the right radio frequency is hilariously dated now. Haven’t gone into first-person-shooters yet, but there are many choices. 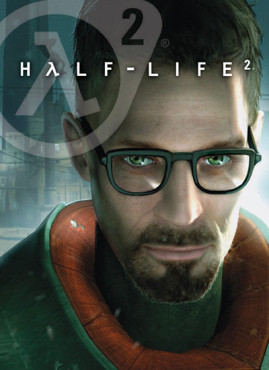 You could cite Doom, Goldeneye 007, or Gears of War, but one that seems to carry even more weight is Half-Life 2. It’s mixture of the usual gunplay combined with creative puzzles has given it a soft spot in players’ hearts that has weathered the never-ending flow of new FPS games. It was also influential in a whole different way, with mods that allowed players to use the engine in all sorts of personalized ways. Another shooter that comes to mind is Bioshock, which created one of the medium’s most memorable worlds in the sunken city of Rapture. The art-deco visuals and recorded monologues from key characters (everyone rips this off now) loaded the game with atmosphere. The story itself had some truly shocking twists and engaged with complex themes in a way that is still rare for games. It didn’t just comment on real-world philosophies like Objectivism, it commented on the very nature of playing video games. Do you have free will while playing a game if you’re just doing what the game tells you to do in order to advance? I still haven’t seen another game with such strong academic credentials. Another game that left players questioning their actions was Shadow of the Colossus. Interesting trivia about this one – when the late Roger Ebert foolishly declared that “video games can never be art,” he said that this game was the one most cited as an example of video game art in the feedback he got. He never did play it; there were too many movies to watch (and he probably should have kept his criticism to topics he knew something about). Those readers were on to something. This game continues to have a sterling reputation for its exciting gameplay and also the tragic undercurrent that begins to emerge. Not all the monsters are aggressive and yet the player is still told to kill every last one of them. In a medium where violence is often celebrated, leaving the player with an ambivalent attitude about their mission was very ambitious. 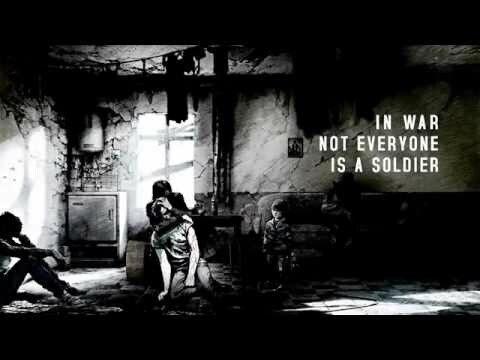 Before we wrap this up, I’d like to submit a game for consideration – This War of Mine. I’ve written about this powerful survivor simulation before and my admiration for it has only grown since then. By immersing the players into the daily grind of survival in a war zone – gathering resources, finding food and exploring dangerous areas – this enthralling game makes a powerful statement about the inhumanity of war in a way that no other medium could manage. It’s not a game that is great for evoking effective techniques of film or television, it is precisely the “game” aspect that makes it great. It’s a smaller game than the other stuff we’ve talked about here, but I hope this game becomes more widely known in the years to come. 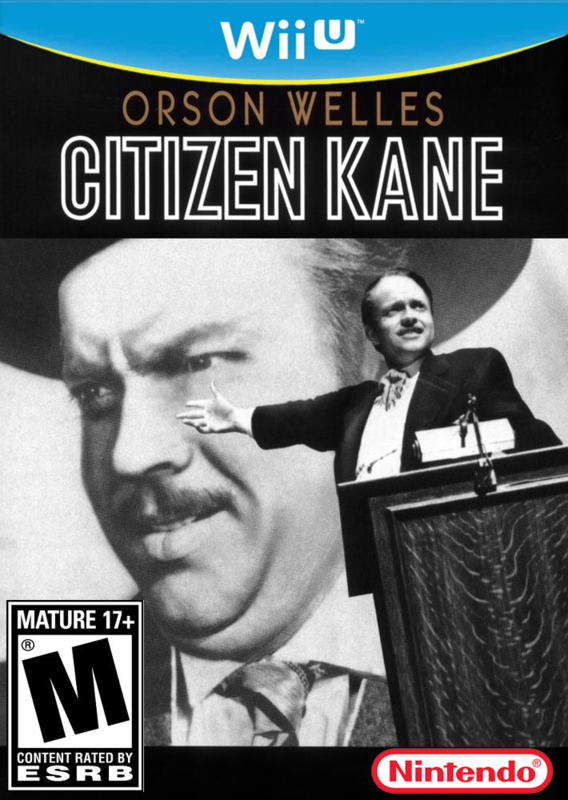 So back to our original question…is there a Citizen Kane for video games? Right now, I would say no. We may never have one. That doesn’t mean more great games won’t come out, I’m confident they will, but I’m not sure it’s possible to have that sense of broad consensus in today’s culture. Film critics anointed Citizen Kane during the late 50s and early 60s, a time when it wasn’t as easy to be a film buff. Home-viewing technology wasn’t even widely available until the early 1980s and by that time, Citizen Kane had been entrenched for decades. Critics essentially decided this question for the culture at large during an era where that was possible. But for games? We all know gamers don’t have a great deal of reverence for critics. It’s hard to imagine the majority would go along with any game that was suddenly given a label of “the best.” The “Top 100” format is probably better in the end. But then again, maybe some masterpiece will come along and earn this crown. Only time will tell. Until then, let us know what you think! Is there one game that stands above the rest? Are there games I missed in this rundown? Tell us in the comments!